As a teacher, Senska applied an approach to ceramics used by her own instructors, particularly László Moholy-Nagoy and Marguerite Wildenhain, as well as by her father and the people of Cameroon: be low-tech, find local resources, build it by hand, and see if it works. With three hundred dollars from the college art department, she and her students purchased foot-operated pottery wheels for their basement studio on campus. Together they designed and built an electric kiln. “We did things which people would never think of doing now. We went out and dug our clay and prepared it and used it, took it all the way from the hillside to the end product,” Senska said in a later reminiscence. She disapproved of the big university ceramics departments where “they had everything and it looked like a factory. 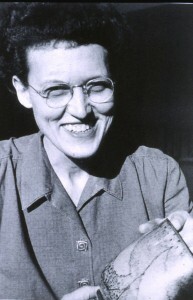 And there wasn’t anything the students did except go and pick up a piece of clay and make something out of it and have it fired by somebody.” Senska similarly objected to the apprenticeship method where students mimicked a master’s work. Instead, she wanted her students to discover their own direction. Her method proved true: among her many successful students were Peter Voulkos and Rudy Autio, two men who became world-renowned sculptors and transformed American ceramic arts. Senska’s partner, Jessie Wilber, chaired the MSU art department and worked with Senska and others to found the Archie Bray Foundation. 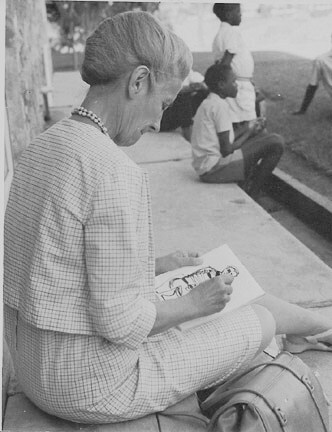 This photo of Wilber was from a trip she and Senska took to Africa in 1966. Photo courtesy of the Frances Senska and Jessie Wilber Collection. That cooperative approach to the arts was also fostered by Professor H. G. Merriam, who founded the Montana Institute of the Arts in 1948. Senska and Wilber encouraged the growth of the Montana Institute, which included writers and artists of many types. They also supported efforts to bring art to Montana communities so the public could share in its enjoyment and creation. In Bozeman, they helped establish the Beall Park Art Center, which now houses the Senska Studio for community art education and the Jessie Wilber Gallery, where works by both women are on permanent display. Senska helped Montana emerge as a prominent ceramics arts center by laboriously building the ceramics program at MSU, nurturing its students for over twenty-five years, and supporting community arts programs. In 1982, MSU formally acknowledged these contributions by awarding Senska an honorary doctorate in art. When Senska and Wilber were co-recipients of the 1988 Montana Governor’s Award for Distinguished Achievement in the Arts, Bozeman’s exuberant art community threw a street celebration in their honor. For more videos featuring Montana women, see our streaming video page. “Clay Artists–Frances Senska.” Craft in America, n.d. Accessed May 16, 2014. “Frances Maude Senska (1914 – 2009).” Bozeman Daily Chronicle (obituary), December 28, 2009. Accessed May 15, 2014. “Frances Senska Suitcase.” Lesson developed by students in the Art Methods class at the University of Montana–Western, n.d. Accessed May 15, 2014. “Humble Grace: A Tribute to Frances Senska.” Exhibit at the Yellowstone Art Museum, Billings, March 19, 2010 – June 27, 2010. Accessed May 15, 2014. McMillan, Scott. “Artists in the West: Frances Senska.” Big Sky Journal, Summer 2003, 34-39. Rod, Luann. “Tea with Frances Celebrates Life of Art.” Bozeman Daily Chronicle online, January 29, 2010. Accessed May 16, 2014. Senska, Frances. Interview by Chere Juisto and Rick Newby, June 9, 1998. OH 1805, Montana Historical Society Research Center, Helena. ________. Interview by Donna Forbes, April 16, 2001, for the Archives of American Art. Transcript available. Accessed May 15, 2014. ________, and Jesse Wilber. Interview by Martin Holt, 1979. OH 1441, Montana Historical Society Research Center, Helena. Smith,Marjorie.“I Make Pots: From Montana Students and Big Sky Clay, Frances Senska Helped Craft a Ceramics Revolution.” Montana State University Newsletter, October 1, 2010. Accessed May 15, 2014. “Frances Senska: Art All the Time.” Montana: Second Century, MontanaPBS, (first aired 1997). Accessed June 3, 2014.